Business analysis and business systems analysis in many organizations is time consuming, resource intensive and fraught with disconnects and misconceptions that typically propagate through subsequent phases of a project. Business is increasingly complex, rapidly changing and often chaotic. Management and staff are typically in a fire-fight mode - focused on in-the-moment requirements rather than on the future state of the business. Subject matter experts, end user staff and management - have differing and often conflicting definitions of requirements within the same business space. No one seems to know "the business" - only pieces. The deep business knowledge of an organization is typically and primarily maintained in the minds of experience staff and management. However, organizations are lean. Access to knowledgeable subject matter experts is increasingly difficult. Everyone needs a solution “now”! There never seems to be enough time to get it right. However, there is little tolerance for getting it wrong. Analysts are under pressure to "get" the requirements quickly. Frequently, the hand-off to the solutions team is a vague set of ambiguous text based requirements that are subject to a wide range of interpretation. Developers are under pressure to design a solution and get it into production quickly. The result is that vague and ambiguous business requirements are interpreted from the perspective of speed rather than qualify of the solution. The result are missed opportunities for improving business processes, costly systems (internally developed or vendor solutions) that often do not adequately support business end user requirements and require substantial and costly on-going maintenance. Inteq’s Blueprinted Business Requirements Templates enable your organization to rapidly overcome these critical and chronic issues. – enabling your organization to focus on improving business process and increasing customer and business value. Gain the edge on competition - save months of time and effort, eliminate false starts and dead ends, jump-start projects - leverage your existing work and the work of our expert team of business and systems analysis professionals. Business requirements represent an organization's forward facing (not necessarily current state) best practices in the form of business processes, procedures, workflows, business rules, resource roles, organizational structure, etc. that enable an organization to be competitive and create sustainable customer and business value. 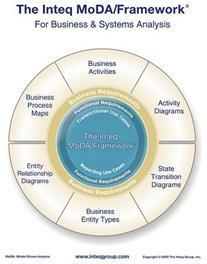 Inteq's Blueprinted Business Requirements Templates include business process maps, business system requirements specifications, entity-relationship diagrams, activity diagrams, state-transition diagrams …and more. Our deep global presence in business reengineering and information technology enables us to identify, thoroughly research and cohesively analyze emerging, trending and rapidly changing business concepts, business processes, best practices and supporting systems. We distill our research, filter through the noise, confusion and myths and organize the results into a cohesive set of intuitive, business-oriented, professional, enterprise-class blueprints. Inteq’s Blueprinted Business Requirements Templates represent a cohesive body of business knowledge and industry best practices coherently organized and presented via intuitive business-oriented visual diagrams and supporting documentation. Click to view Inteq’s MoDA/Framework™ for details. … and many new blueprinted template sets are in-progress and available soon! Improve or reengineer your business processes. Use our best practice business process maps as a foundation to analyze and gap your business processes and accelerate the design of your future-state processes. 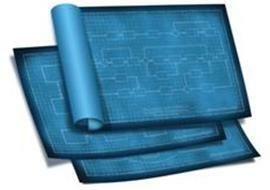 Identify business system requirements for selecting commercial software applications. Use our business requirements templates as a basis for identifying business system requirements to evaluate vendor solutions. Identify and specify business system functional requirements. Utilize our business requirements templates combined with the entity relationship diagrams to develop use-cases to specify functional requirements. Our Blueprinted Business Requirements Templates provide the quality, depth and range of business and systems analysis that you need to engage and gain the critical edge. See the side column for additional detail on the business value and business case for utilizing Inteq’s Business Analysis Blueprints. Staring with one of Inteq’s Blueprinted Business Requirements Templates sets, our team of professional business and systems analysis will work with your analysts and subject matter experts to integrate your business requirements with the blueprinted template set to create a customize hybrid best practice blueprinted template set tailored to your specific organization and unique requirements. Your organization has invested significant resource time and effort over many years developing business requirements documents – albeit a wide range of styles and formats and often developed ad-hoc without standards. Let our team of professional business and systems analysts forward engineer and convert your existing and highly valuable knowledge base into to a consistent standardized set of Blueprinted Business Requirements Templates based on Inteq’s MoDA/Framework™. This approach enables you to gain significant leverage going forward on your prior investment in business analysis - across analysts and across projects. Let our team of professionals work with your analysts and subject matter experts to rapidly map and thoroughly analyze existing requirements and blueprint forward facing best practice requirements. Let’s discuss your business requirements and identify opportunities to leverage Inteq’s Blueprinted Business Requirements Templates to achieve your business and systems analysis objectives. It's that simple – contact us today!